AkzoNobel has joined forces with Northumberland College in order to upskill its workforce. 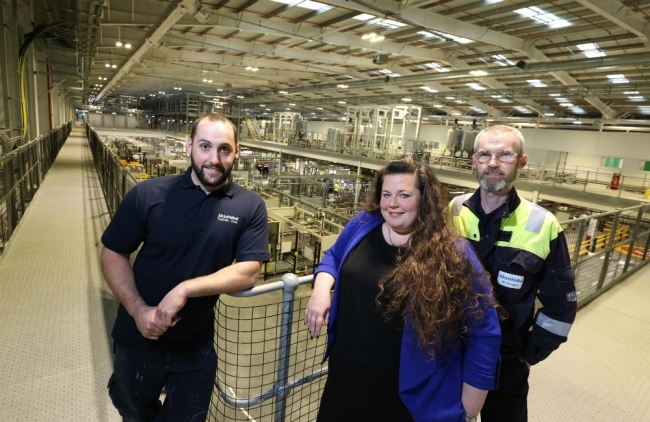 Having already created over 160 highly-skilled jobs as well as over 100 more in the local supply chain since opening its state-of-the-art manufacturing unit in Ashington in 2017, AkzoNobel wanted to continue the development of its team now that the site is in full production by introducing an apprenticeship scheme. After looking at the different training programmes available locally, it became apparent to AkzoNobel that there was nothing currently on the market that matched the levels of automation that are built into the £100 million Ashington site. The company approached Northumberland College, which is ideally located just one mile from the plant, about the possibility of creating a bespoke programme which would cater to the site’s unique training needs. “Creation of the bespoke scheme involved consultation from the very early stages between our on-site engineers and the lecturers and staff at the college who brought much creativity and enthusiasm for the scheme to the site. Existing operators at the site were chosen for the first run of the new Maintenance and Operations Engineering Technician Apprenticeship Standard which will see them become experts in their field from an operational, maintenance and engineering perspective. One such apprentice is Stephen Cook. Having previously worked as a temporary operator at AkzoNobel’s Prudhoe site, Stephen made the move to Ashington during the site’s construction. Now employed full-time as a process operator, Stephen is one of two employees to be receiving training through the apprenticeship scheme at Northumberland College. “I have been able to learn the site’s unique processes from the ground up and have gained valuable experience across the board from the implementation phase which is now helping me to do my job. The AkzoNobel apprenticeship programme has been developed in partnership with Northumberland College as part of a new apprenticeship standard. The standard has been brought in to help colleges across the country to develop new delivery structures for vocational courses which take into account the needs of local businesses to create programmes which are targeted specifically to employers’ needs. Sara Sawyer, from Northumberland College, concluded: “The new Maintenance Engineering and Operations Engineering Technician Apprenticeship Standard has given the college the freedom to develop a new programme that really embraces the need to train the next generation of engineers within their specialist roles without some of the limitations of previous curriculum programmes. This allows us to be much more flexible in working with local employers in addressing their skills gaps.